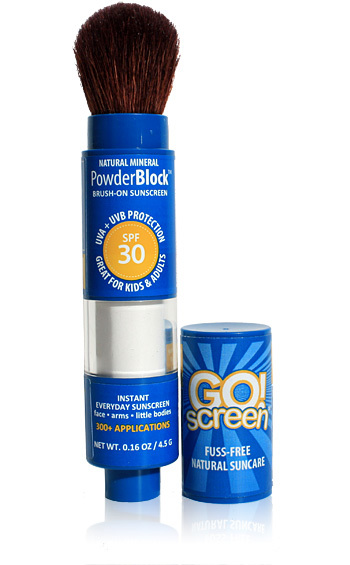 A brush-on mineral powder sunscreen for the whole family! Kids love it because there's no greasy skin or burning eyes. Parents love that it's a chemical free sunscreen that provides highly effective UVA/UVB protection and can be applied quickly without any sticky mess. It essentially acts like thousands of umbrellas on your skin. Produced from naturally occurring zinc ore. Zinc Oxide is one of earths most abundant minerals. Zinc oxide protects your skin simulating thousands of tiny umbrellas on the skin's surface by absorbing and shielding your skin from the full UV spectrum of sunrays. It is a natural physical sunscreen (titanium dioxide is another good mineral for filtering UVA/UVB rays) compared to chemical sunscreens that have been synthetically created. What makes Zinc Oxide a good filter is that it is an earth mineral. Although it has been crushed down to a powder, it maintains a powerful barrier to the sun's rays. Therefore, it is very stable and does not penetrate the skin. More importantly, it won’t breakdown in the sun. In scientific terms, it "is safe from oxidative free radical production and chemical damage." If your children are like mine, and RUN when you mention putting on sunscreen, GO!screen is definitely a product you'll want to stock up on this Summer! I have been using mineral makeup for years and I appreciate that it has a natural SPF, so I was excited to try all new GO!screen mineral sunscreen out with my family. With virtually no scent, and the same lite non pour clogging formula that I've come to know and LOVE with my mineral makeup, I knew that this wasn't something that the kids would run from, and I was right. The GO!screen brush (pictured above) actually houses the mineral sunscreen in the handle, you simply click the button to dispense the minerals onto the brush for a simple mess free application. The real test was to see if the kids could run around in the sun for an extended period of time without getting a sunburn. Not only did the GO!screen hold up in the sun for hours, I didn't have to continuously reapply it. My kids (as well as my husband and myself) love GO!screen, it has simplified a task that they normally don't enjoy, and made it simple to protect our skin from the sun. GO!screen is an absolute essential this summer for families on the Go! 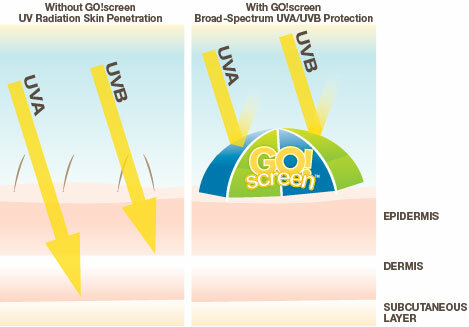 Protect your family from the sun this summer with GO!screen! 3 Lucky Reader's will each receive GO!screen SPF 30 (300 Applications in one brush!). Leave a comment~Why are you excited to try GO!screen? The comment is considered your entry. Entry to this giveaway ends at 12pm PST May 26, 2011. Winner's are chosen randomly through random.org.The winner will be announced in a post within 7 days of the giveaway ending, and contacted through email. The winner will have 48 hrs. to respond or another winner will be chosen. I am excited to try GO!Screen because I have never used anything but traditional sunscreen and this seems much more kid friendly. I'm excited to try it because it seems so easy to use plus it gives excellent coverage! 1 I "Like" GO!screen on FACEBOOK. 2 I "Like" GO!screen on FACEBOOK. 3 I "Like" GO!screen on FACEBOOK. 4 I "Like" GO!screen on FACEBOOK. 5 I "Like" GO!screen on FACEBOOK. 6 I "Like" GO!screen on FACEBOOK. 7 I "Like" GO!screen on FACEBOOK. 8 I "Like" GO!screen on FACEBOOK. 9 I "Like" GO!screen on FACEBOOK. 10 I "Like" GO!screen on FACEBOOK. 3 I entered your XO Laptop + Betty Crocker Prize Pack Giveaway. 4 I entered your XO Laptop + Betty Crocker Prize Pack Giveaway. 5 I entered your XO Laptop + Betty Crocker Prize Pack Giveaway. 3 I entered your Little Tikes Cozy Truck Giveaway. 4 I entered your Little Tikes Cozy Truck Giveaway. 5 I entered your Little Tikes Cozy Truck Giveaway. 1 I entered your HelloCanvas Giveaway. 2 I entered your HelloCanvas Giveaway. 3 I entered your HelloCanvas Giveaway. 4 I entered your HelloCanvas Giveaway. 5 I entered your HelloCanvas Giveaway. 1 I entered your GourmetGiftBaskets.com Giveaway. 2 I entered your GourmetGiftBaskets.com Giveaway. 3 I entered your GourmetGiftBaskets.com Giveaway. 4 I entered your GourmetGiftBaskets.com Giveaway. 5 I entered your GourmetGiftBaskets.com Giveaway. 1 I entered your Mommy's Medicine Cabinet Giveaway. 2 I entered your Mommy's Medicine Cabinet Giveaway. 3 I entered your Mommy's Medicine Cabinet Giveaway. 4 I entered your Mommy's Medicine Cabinet Giveaway. 5 I entered your Mommy's Medicine Cabinet Giveaway. I'm excited to try this because mineral powder makeup goes on so easily - this looks wonderful. Plus, sunscreen lotion always seems to leave a trace on your hands - if you rub your eyes you're in trouble! It looks like an easy application I might even actually use. I think it would be great to use on the kids. 1 I entered your ProFlowers Giveaway. 2 I entered your ProFlowers Giveaway. 3 I entered your ProFlowers Giveaway. 4 I entered your ProFlowers Giveaway. 5 I entered your ProFlowers Giveaway. I'm excited to try it because I hate the greasy feeling of sunblock - I also feel like it clogs my pores and makes my skin worse. I'm excited to try it cause it's new and the powder seems so much more practical than a lotion!